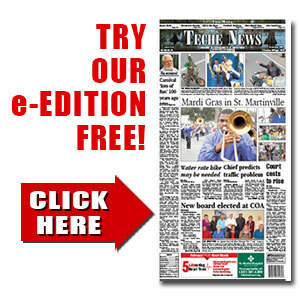 POLICE REPORT | TecheToday.com | Teche News | St. Martinville, La. The following arrests and/or citations were reported in St. Martin Parish from Monday, August 1, through Sunday, August 7. Babineaux, Joshua, 31, 200 block of Chester St., Lafayette; simple burglary/movable or immovable; theft of a firearm, St. Martin Sheriff’s Office (SMSO). Begnaud, Codey, 44, 4000 block of Poydras Hwy., Breaux Bridge; parole violation (SMSO). Celestine, Shelton, 60, 400 block of Sterling St., Breaux Bridge; simple burglary/movable or immovable; simple criminal damage to property (SMSO). Demouchet, Stafull, 51, 700 block of Anderson St., Breaux Bridge; simple burglary/movable or immovable; entry or remain in places after forbidden (SMSO). Henderson, Zachary, 38, 00 block of Oak St., Leesville; hold for usm (SMSO). McGee, Joshua, 30, 1000 block of Dalfrey Rd., Breaux Bridge; probation violation (SMSO). Poirier, Rusty, 30, 1000 block of Adley Loop, Breaux Bridge; failure to appear; issuance of arrest warrant (SMSO). Melancon, Shantell, 36, 1000 block of Camp Bon Temps Rd., Breaux Bridge; theft of a firearm; possession of firearm/concealed by convicted felon (SMSO). Newman, Dedrionne, 22, 5100 block of Venus St., New Orleans; illegal possession of stolen firearms, La. State Police (LSP). Newman, Gregory, 28, 6600 block of Rue Louis St., Marrero; switched plates; driver must be licensed (LSP). Simmons, Brice, 22, 700 block of Wild Cherry Ln., Breaux Bridge; failure to appear; issuance of arrest warrant (SMSO). Stelly, Devlin, 29, 1000 block of Gabriel St., Breaux Bridge; duty to notify law enforcement of address change (SMSO). Alexander, Damien, 37, 1000 block of Zin Zin, Breaux Bridge; hold for (SMSO). Babineaux, Tanerian, 17, 600 block of Cecilia Blvd, Breaux Bridge; possession of marijuana w/intent to distribute; aggravated battery; disturbing the peace, Breaux Bridge Police Dept. (BBPD). Charles, Zataski, 37, 600 block of Molbert Ln., Breaux Bridge; child endangerment/domestic abuse; simple criminal damage to property (BBPD). Filer, Troy, 21, 300 block of Ledoux St., St. Martinville; possession of firearm/concealed by convicted felon; prohibited acts, schedule IV, penalties; possession firearm committing/attempt crime (SMPD). Matthews, Gilbert, 19, 1000 block of Phillip Calais Rd., Breaux Bridge; possession of marijuana w/intent to distribute; prohibited acts: distribution of drug paraphenalia; possession - schedule II narcotics; disturbing the peace (BBPD). Morgan, Rocky, 29, 200 block of 1/2 Myrtle St., Abbeville; failure to appear; issuance of arrest warrant (SMSO). Preston, Melanie, 38, 2900 block of Greenbriar Rd., Abbeville; failure to appear; issuance of arrest warrant (SMSO). Templet, Julian, 37, 100 block of Timothy St., Pierre Part; outside agency warrant--extradition required (SMSO). Alexander, Harris, 51, 400 block of Skipper St., Breaux Bridge; illegal use of a weapon; possession of firearm/concealed by convicted felon (BBPD). Bell, David, 39, 1200 block of Duchamp, Broussard; outside agency warrant – extradition required (SMSO). Escoyne, Tyler, 21, 1000 block of Eva Lane Hwy., Breaux Bridge; monetary instrument abuse/provides definitions; operating vehicle while license is suspended; marijuana - simple possession; prohibited acts, schedule IV, penalties; manufacture; distribution; PWITD SCH II narcotics; manufacture; distribution - schedule IV; possession firearm committing/attempt crime; possession of firearm/concealed by convicted felon (BBPD). Fredrick, Robert, 30, 1000 block of Lee Gordon Rd., Breaux Bridge; Charges battery of a police officer; resisting a police officer with force or violence (SMSO). JeanBatiste, Dequasius, 31, 1600 block of Baez Rd., New Iberia; unauthorized entry of an inhabited dwelling; simple battery (SMPD). Luhring, Ronald, 34, Homeless. failure to appear; issuance of arrest warrant (SMSO). McGee, Brocky, 35, 1000 block of Newton Rd., Breaux Bridge; violation of protective order (SMSO). Morris, Albert, 38, 1000 block of Promise Land Drive., St. Martinville; failure to appear; issuance of arrest warrant (SMSO). Patin, Chuck, 46, 1500 block of Nina Hwy., Breaux Bridge; failure to appear; issuance of arrest warrant; failure to appear; issuance of arrest warrant (SMSO). Talley, Kent, 28, 1000 block of Chawee Rd., Breaux Bridge; simple burglary/movable or immmovable (SMSO). Viator, Wilfred, 50, 1600 block of Hebert Lane Hwy, St. Martinville; 2nd degree murder/non-negligent manslaughter (SMSO).